Hi everyone! I have been on vacation the past week, and it was wonderful! For those of you who have recently contacted me or commented with questions, I promise I will get back with you over the next couple of days - I'm excited to see a lot more people have been reading recently! Summer break certainly helps with time to scout out new blogs, doesn't it? August is here, which of course means it is officially Back-to-School season but also means a new Currently from Farley! Time to link up! Listening - Why is it that pets always believe that they are starving? My cute little guy eats like a little piggie, that's for sure! Loving - My classroom WILL be 100% ready to launch this year before the kids arrive! Woo hoo! Always important, especially after last year's fiasco. I've already had the opportunity to go in and purge a few cabinets, so real progress is already being made. Thinking - Over the summer I conquered the "Couch to 5K" program! I've always been active, but running has never been something I've been successful at (really bad side stitches, really bad!). C25K has changed all that, and I am now running 5K straight through without stopping! I signed up for my first race, which will be at a local town's annual festival a week from today. Can't wait to be able to wear my first official 5K race tshirt! I highly, highly recommend this program to anyone who wants to start running but has never been able to and/or doesn't know where to start, I cannot say enough good things about it. It's amazing what it trains you to do in only 8 weeks! 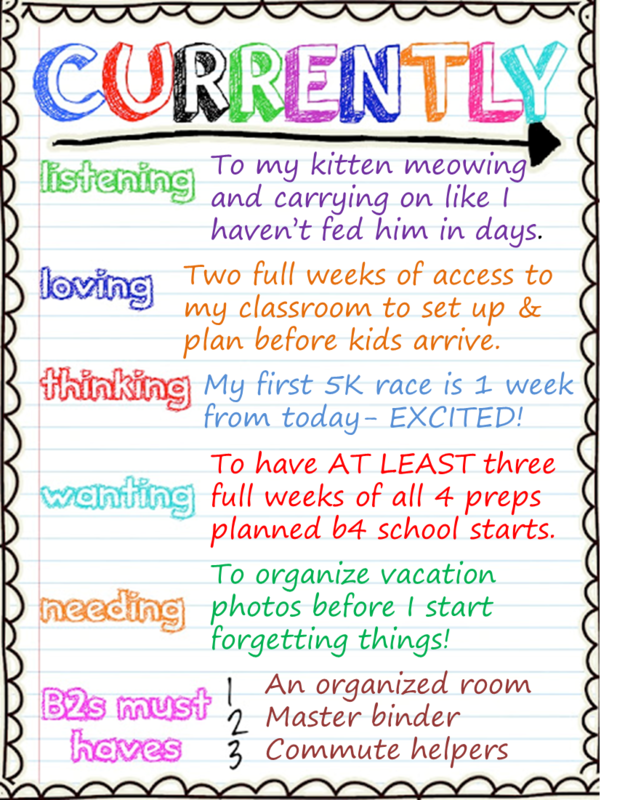 Wanting - At minimum, I want to have at the VERY LEAST three full weeks of planning fully completed before school begins. I only have four preps this semester (six classes total, two repeat during the day - yippee! ), and all but one I have taught before, so this is completely realistic. Hopefully I'll get much more done, but it's hard to go too far in advance without knowing your kids and their particular talents and quirks. B2S Must Haves - I'm assuming the necessary planning and preparation are givens, right? First for me is an organized room, so that I know where everything is and it makes sense to me before the room is "active." Saves sooooo much time and frustration! Next is the "master binder" - syllabi, unit & lesson plans, sub folder, rosters, etc, etc - you know the drill. And finally for this year I'm adding "commute helpers." My drive this year is going to about twice as long last year, so I want to make sure that not only do I keep myself from going crazy but that I actually put the time to good use. Checking out some podcasts, good music, and the like to use the time. Hello! Good luck on your first 5K! I'm beginning to train for a half-marathon. Running has been a real stress reliever for me. Thanks! I find it's a great way to start the day, because I can organize all of my thoughts and get the day on track! Thanks, I can't wait! I think a 10K will be my next step too, but I'm going to spend some time maintaining first and get some regular mileage on my shoes! This special deal has been reopened as of November 2016! A bundle of over 100 FACS resources in exchange for a small donation to the Leukemia & Lymphoma Society! I'm a FACS teacher always on the lookout for ideas of how to organize all the crazy classes I teach! And That's My New Philosophy! Share book reviews and ratings with Denise, and even join a book club on Goodreads.